The colors in this painting are so peaceful and calm. Great memories of lake sunsets. This is the quintessential view of lake life . . . in my opinion. Hoped to paint outside today but rain demanded a still life! Update: I'm incredibly honored to have this painting juried into the 2016 Hoosier Salon! 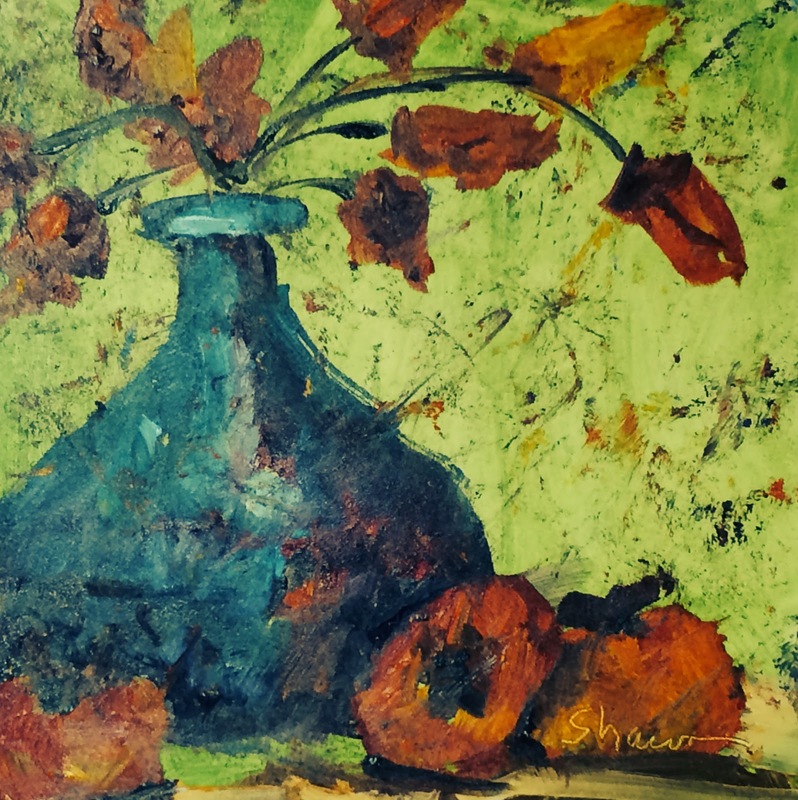 I am thrilled to be selected as a 2016 Hoosier Woman Artist. 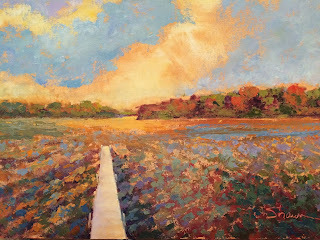 My painting, Morning glory, will be hanging in the Lt. Governor's office for the next year. 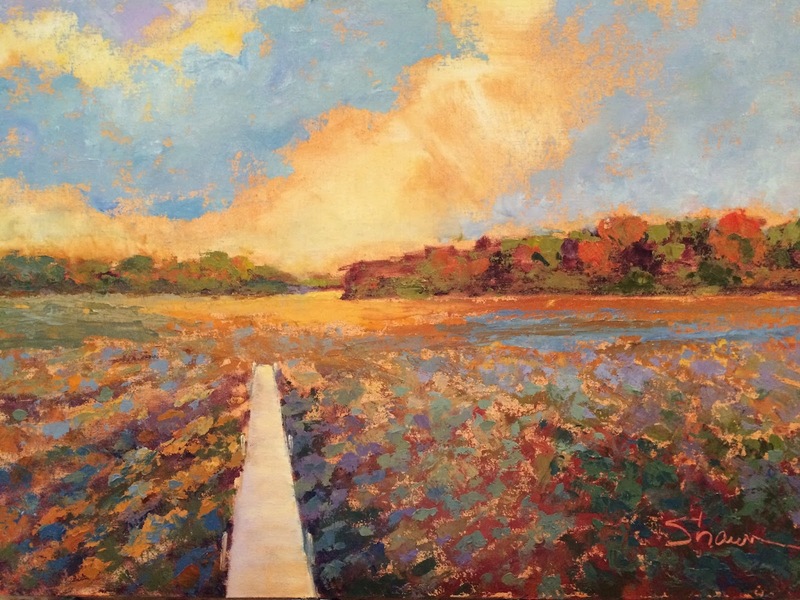 This is such an honor to be recognized and included with such a talented group of Indiana women artists! 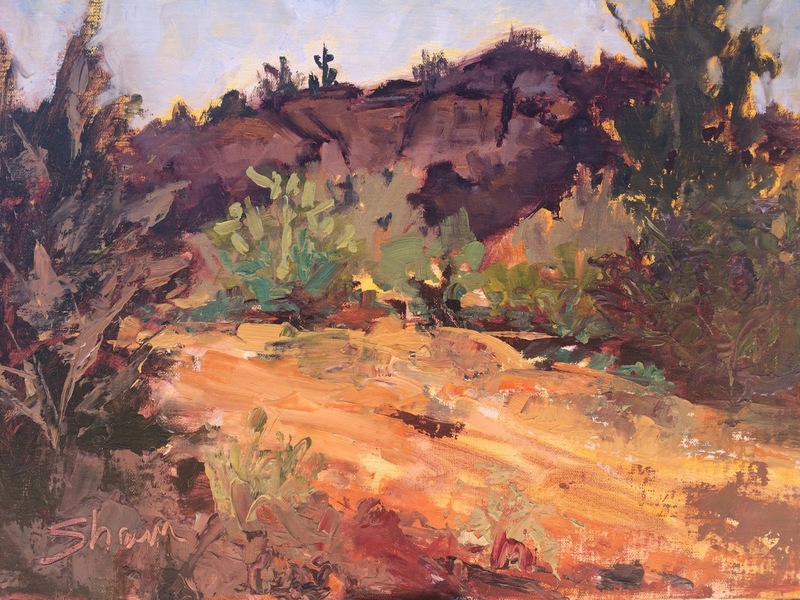 This painting, Ocotillo Trail, received a Special Merit Award from among 738 artists representing 28 countries. 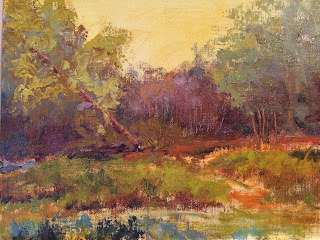 It will featured in the 6th annual 'Landscapes Art Exhibition' of the Light Space and Time online gallery through April. 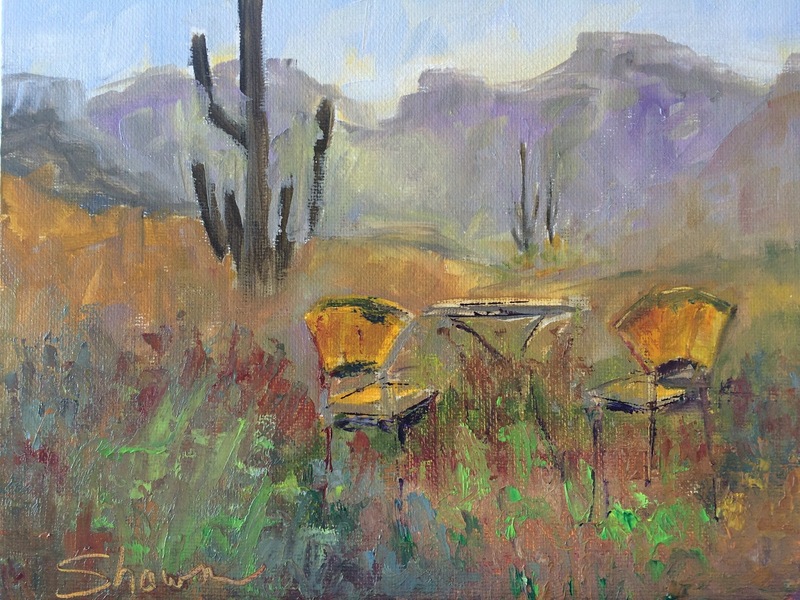 This was a fun spot to paint in the Saguaro National Park, Tucson, Arizona. A professional photographer was hiking for photos and snapped a photo - he'll turn it into Arizona Highways for a possible future issue. 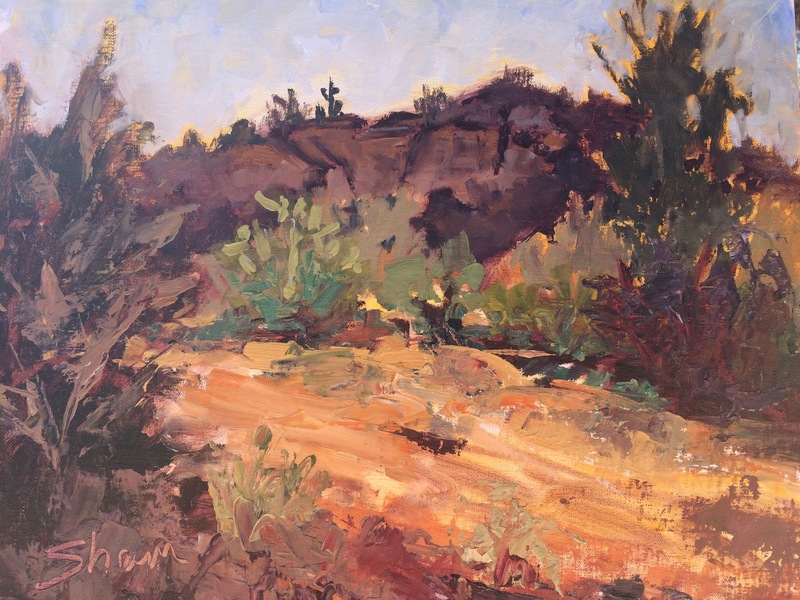 Quite honored to have this painting, Wild Burro Wash, juried into the 'Sunlight and Shadows' landscape show at the Toscana Gallery in Tucson. The exhibit will run through August 15, 2016. What a view - and so easy to plein air paint right out the back door. 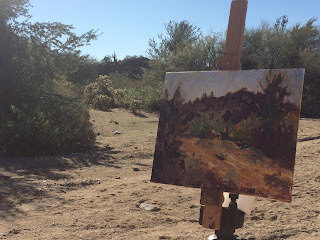 Fun day plein air painting with friends also visiting Tucson. 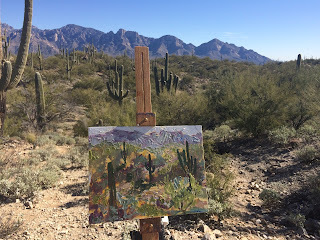 They were amazingly prolific creating two - three paintings each day. Me, not so much! 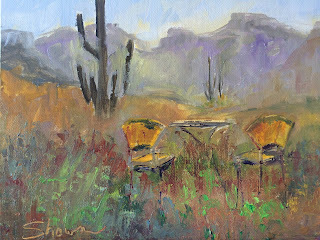 Plein air painted recently in beautiful Honeybee Canyon just north of Tucson. 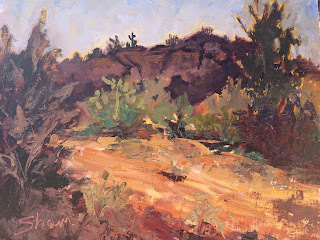 Can't believe how lucky I am to have met a fellow plein air painter from Colorado who is staying just down the street! Tara Inn in Pennsylvania is owned by my friend's mother-in-law. 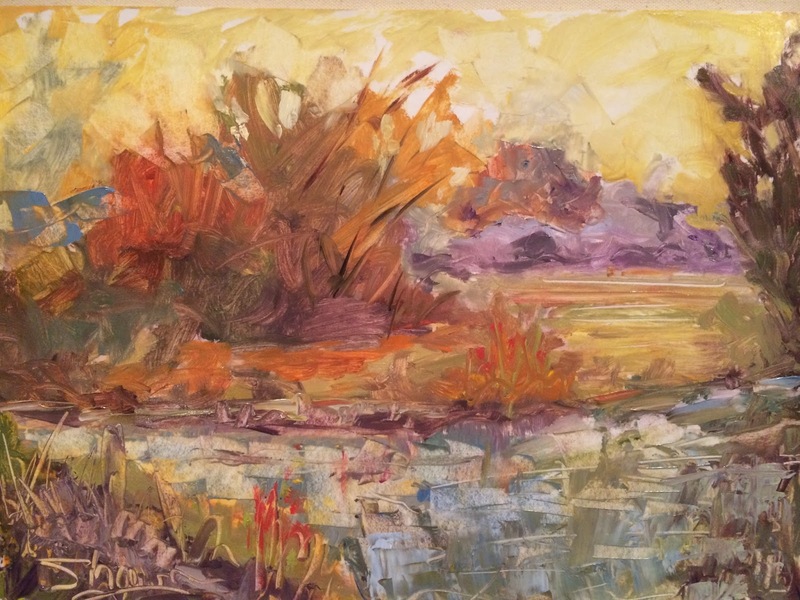 This painting was a special, and much loved, gift. I'm frequently dropping my husband off at various 'boat' launches along White River for kayaking. Just one of many beautiful spots along the river. Intended to paint a beautiful oak tree but couldn't help painting the painter . . . 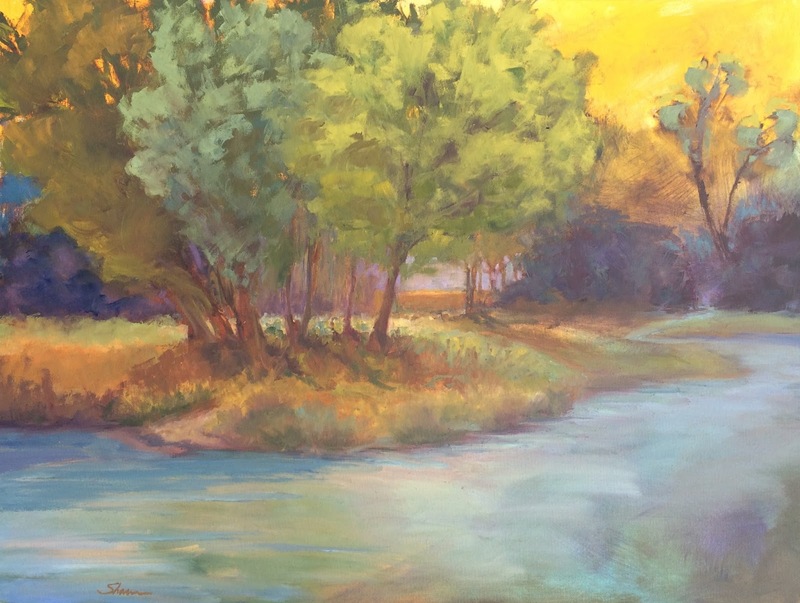 This painting of White River will be displayed and for sale at Conner Prairie Living History Museum through January 10, 2016. 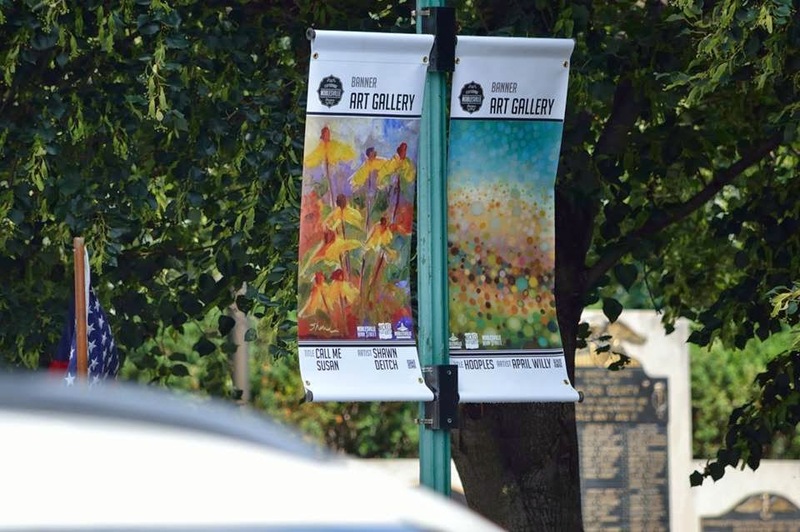 The exhibit is a collaborative partnership between the Hamilton County Artist's Association and Conner Prairie. 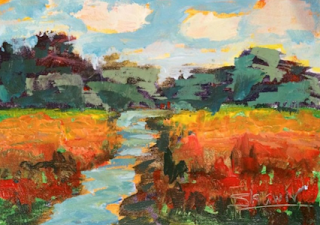 A small contemporary landscape for the HCAA 65th Annual Art Show. 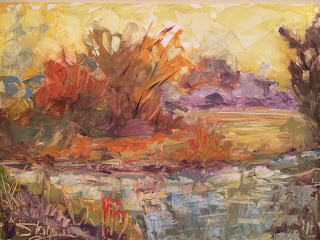 I was looking through photos of the very few paintings I created this fall and thought, "Umm, I like that one. Where is it?" Well, it's nowhere to be found. I'm sure it will turn up someday! I painted this one specifically to benefit the Tippecanoe Watershed Foundation. 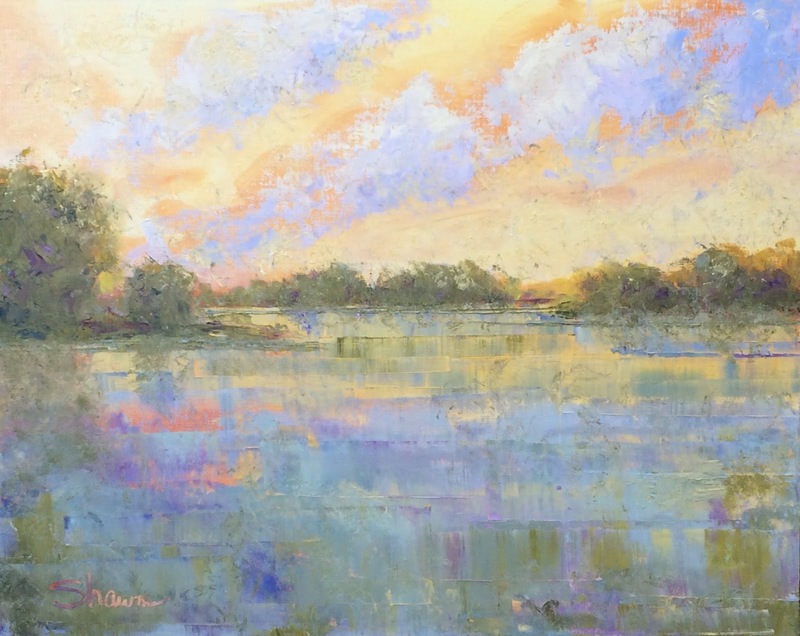 It will be auctioned on Saturday night and proceeds will be used toward protecting and improving the lakes and streams of the Upper Tippecanoe River Watershed for today and the future. Another popular spot in for coffee and tea. And they have tasty other treats too sampled while painting in the area. 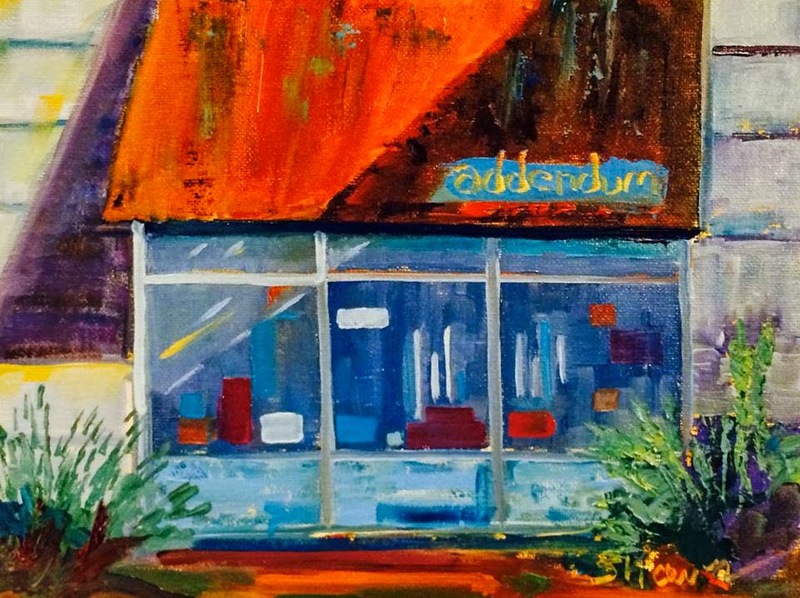 Addendum Gallery, painted last summer, is a wonderful shop featuring in hand-crafted art pieces and imaginative gifts. 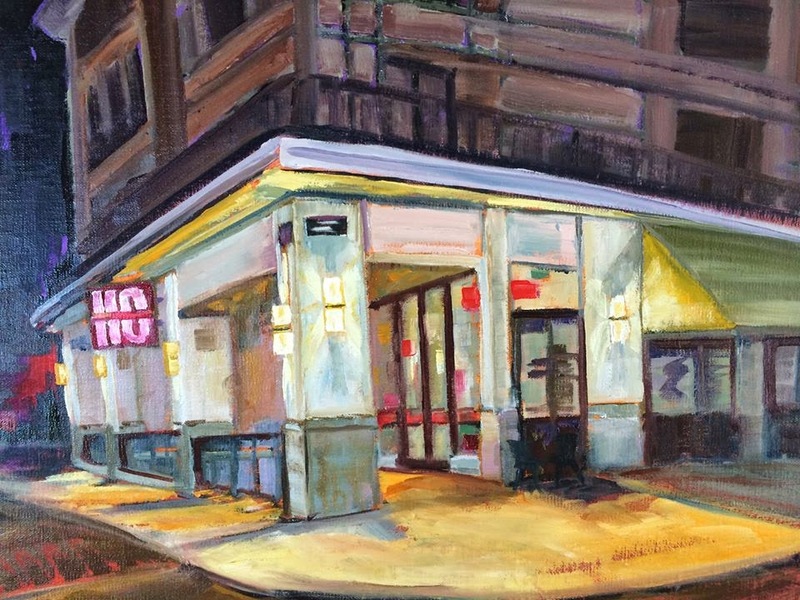 Enjoyed painting this and punching up the colors of the traditional facade. 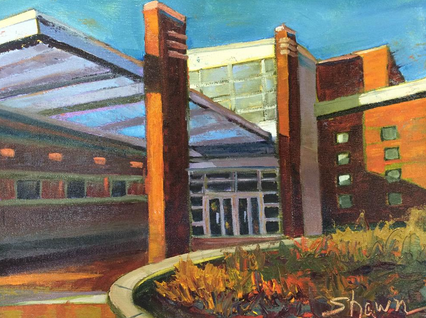 Interesting architecture, gorgeous and extensive gardens, walking paths, and a wealth of fitness options including indoor and outdoor pools serve the citizens of Carmel, Indiana at the Monon Community Center. 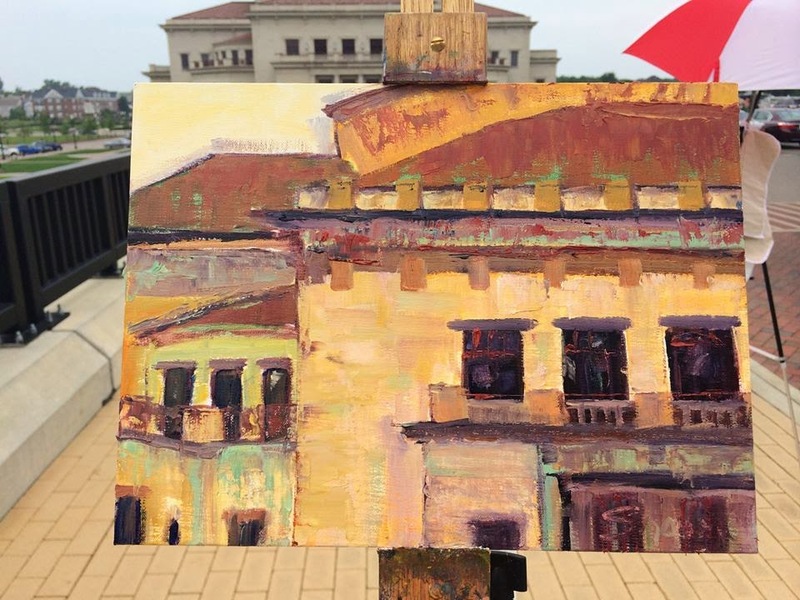 This was painted in 2014 in plein air from the Carmel City Center viewing the Palladium, a state-of-the-art concert hall in Carmel, Indiana. The next few posts should have been written in 2014; however, it didn't happen. If you haven't eaten at Eggshell Bistro at the Carmel City Center then you truly do not know what you're missing! Fabulous vintage Euro style bistro serving breakfast and lunch that you will return for over and over again. 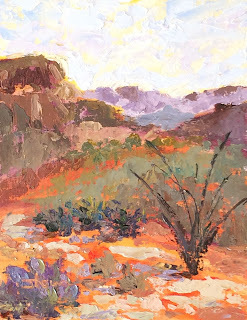 Shawn Deitch is a contemporary impressionist painter who splits her time between Carmel, Indiana and Tucson, Arizona. 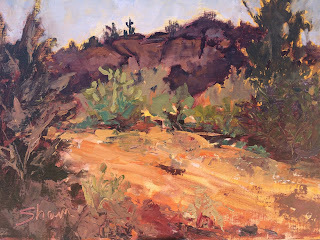 She draws inspiration from nature and has a special interest in Indiana wetlands & lakes and Sonoran washes and vistas. Many of her paintings are plein air painted on site in the open air. Shawn has studied oil painting with regional and national artists including Jerry Points, Pamela Newell, David Slonim, Wyatt LeGrand, Debra Huse, Albert Handell, and Shelby Keefe. 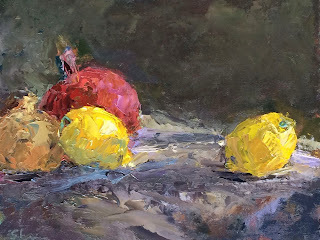 ----------------------------- Art expands my world - and a very colorful world at that! Rich, vivid colors frequently fill my work saturating the painting with emotion. 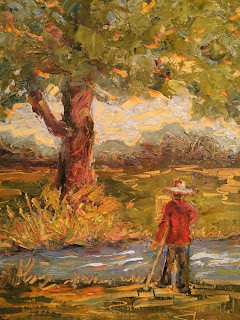 The great majority of my paintings are alla prima, even the large pieces. I love the satisfaction of beginning and finishing a painting in one day, even if it's a very, very long day. Art brings me joy and hopefully will bring joy to you as well.